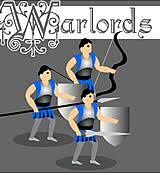 Warlords: Ever dream of commanding a huge army? With Warlords you can. Choose from tons of different armies and fight in a vast world. Earn money to buy more units and upgrades. Use your medieval skills to conquer all in a fabulous game. Mother Load: Ever wonder whats under Mars. Use a giant drill to mine the exotic wonders of Mars. Bring dynamite, explosives, repair bots, and upgrades to find all sorts of minerals. Be sure to get to the surface before you run out of fuel though. Oh and watch out for the surprise at the end. Youda Camper: Welcome to Camping Tycoon. 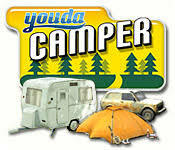 With Youda Camper you build the biggest and best campground ever. You'd think this game cost money to play because it has so much stuff, but actually it's free. Simpsons Movie: Wrecking Ball Hit: If you watched the movie, you would know Homer was in a wrecking ball attempting to free his family. That is what you do here. You hit the police truck as hard as you can and free the Simpson family. Be Warned though each level gets harder, you may find yourself on a hard place. You know what I mean! Simpsons Movie: Ball of Death: If you watched the movie, (as said above) you would know that Homer, was at a carnival, and participated in the Ball of Death, for ten bucks. He had to go around the ball one time, in order for him to win the host of the Ball of Death's, car. That is what he does here, except you must avoid this and get that in order to win, also. Simpsons Movie: Gone Fishing: (kinda related to movie). Homer and Bart are fishing.Whoo-hoo! Avoid catching the mutated fish and only catch the good stuff. We eat tonight!!! Simpsons Movie: 3-Card Moe: (not related to movie) Find the Joker out of the three cards, Moe keeps switching. As time goes on his bar tending hands gets quicker. Finally a real gambling game! Rockface Rescue: Save the helpless people, using your helicopter and wing man. Avoid rocks, water, trees, and anything else in your way. Be sure to save the livestock as well as the people though, for it scores you points and is the right thing to do. Cave of Despair: Help Dr. Carter, swing his way to safety, before the lava tsunami hits him. It's fun to see a little guy get torched. Governor Of Poker: Choose between a female or male Texan and play your way through poker tournaments to the top. Keep kicking but and become the Governor of Texas poker. For those who want poker power, this is your game. Classroom Pilot: Be the bad boy you've always wanted to be, by flying a custom made paper airplane in the classroom, hitting whomever you like (however, the goal is to hit the target on the chalk board). This is marked as the best school game on our site! McCain vs Obama: Choose your candidate, recruit your staff of three, and take control of the United States. Remember to use any attack means necessary to kill your opponent, whether it be McCain or Obama. This is truly the best political strategy game to hit the U.S in history! Bloxorz: A very interesting concept. 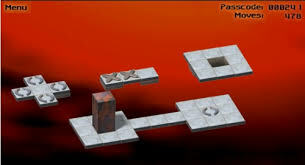 You control how this certain block moves (by turning up, down, or side to side), on a floating puzzle board. The goal is to get the block through the hole in the puzzle board and not to go off the board. It may sound boring, but when I see people play, they can't take their eyes off the computer screen. See if your another victim of this alluring game, PLAY BLOXORZ. Snow Line 1: A #1 hit on many other game sites, now a hit on 21centurygames. Santa has lost some of his presents, and is giving the reindeer a break. It's up to you, to make a snow path that Santa can travel on safely, while he gets the missing presents and crosses the finish line. 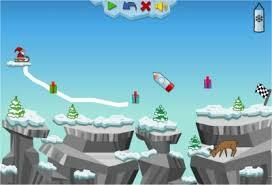 Snow Line 2: A Sequel too the highly popular Snow Line 1, with completely new stages, new obstacles, and an elf as Santa.